Orce Serrano Hams is an online Spanish delicatessen specialising in hand painted Spanish ceramics and artisan cured meats from Andalucia. 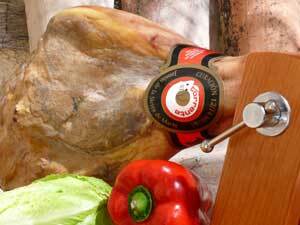 Based in the Granada region, Orce Serrano Hams is a family run business established in 2006. Run by Gayle Hartley and Iain Macdonald the business celebrated its fifth year in 2011 and now supplies Spanish ceramics and terracotta cookware worldwide. Gayle and Iain provide a fresh approach to online Spanish shopping and the business boasts one of the largest selections of traditional Spanish ceramics available. 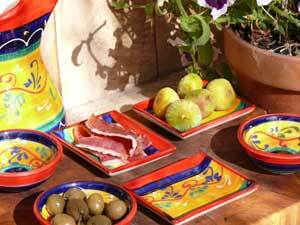 Tapas bowls, platters and hand painted dishes in various sizes and Spanish designs in vibrant Andalucian colours to compliment your Spanish table and tapas spread. These unique Spanish ceramics are sourced direct from manufacture in Spain, some even commissioned just for the business and because each piece is hand made and painted no two are the same ensuring that you receive something typically Spanish and unique from Andalucia. Looking to buy Spanish cazuelas? Look no further! 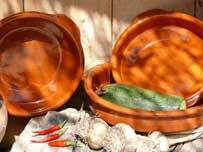 Spanish cazuelas can be found in every Spanish kitchen, these terracotta dishes from Spain are suitable for a multitude of uses and are extremely versatile. Orce Serrano Hams stock a range of different sizes for all your cooking and tapas serving requirements from the mini 8cm cazuela up to the large 46cm giant cazuelas for roasting. 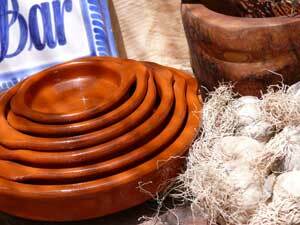 The business also offers cazuela variations such as the sarten  a terracotta cazuela with a handle which is suitable for cooking portions of tapas and also terracotta tapas trays. For the budding cook you can also choose from some unique cazuela collections including cazuela tapas kits, serving sets and cooks set for all your Spanish cooking requirements. The humble cazuela can be used in the oven, on the hob, barbeque and open fire making it one of the most widely used pieces of Spanish cooking equipment in Spain today. 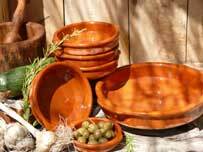 Order from Orce Serrano Hams and you will also receive a cazuela care sheet detailing all you need to know to achieve the most from your terracotta. 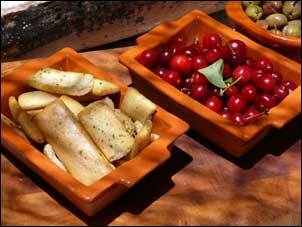 If you are looking to serve your tapas in typical Spanish style then Orce Serrano Hams has the solution. 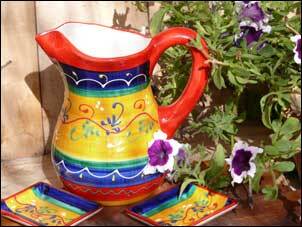 Customers can choose from four ranges of Spanish ceramics in different styles from four different areas of southern Spain. Discover the hand painted blue and white from Granada or hand made pieces from the town of Guadix with a local rustic charm. 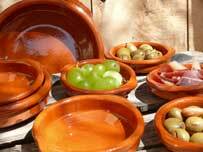 For something a little brighter the Jaen range depicts the colours of Spain with its deep reds and mustard yellows and there is of course the terracotta range which not only incorporates the cazuela but also some interesting mini clay baking trays and deep terracotta serving bowls. 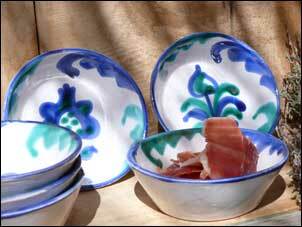 Orce Serrano Hams offers ceramics in a plethora of different shapes and designs offering the convenience of small tapas bowls to platters for your sliced meats, olive oil pourers, gazpacho bowls and much more  all hand painted in Spain. Spanish tapas are traditionally small bites of food enjoyed with a drink in Spain so why not create your own piece of Spain with some traditional and vibrant tapas servers? Gayle and Iain take care to choose artisan produce for their customers, from Spanish hams, chorizo sausage or ceramic tapas bowls customers can be confident that they are buying the finest available from the region. The pair also regularly visit their suppliers and producers to choose stock, fulfill special orders and learn about production techniques all of which helps forge relationships for the future supply of the very best artisan goods and produce available from rural Andalucia. Gayle and Iains website is beautifully photographed with detailed descriptions so customers get a feel for their purchase before it arrives. Every order is dispatched direct from Spain and will reach European destinations in only 5 days or less. 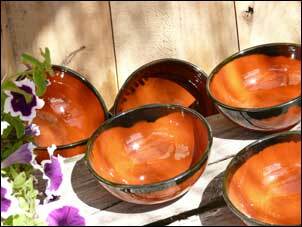 Ceramics are carefully packaged using recyclable materials and terracotta cazuelas also come with comprehensive care instructions. Buying Spanish ceramics could not be easier, through their secure online payment system or of you prefer to speak to either Gayle or Iain they are always on the end of the phone to take your order, offer advice and discuss any questions you may have. Orce Serrano Hams offers worldwide shipping on Spanish ceramics and is currently expanding its network of independent retailers, restaurants and other traders. Are you a business looking for Spanish ceramics? Why not email Gayle and Iain now for a trade pricelist? Gayle and Iains range of ceramics have attracted chefs worldwide and have been used at the Mayors Thames festival, Wilderness festival, various food exhibitions and tapas bars as far afield as Sydney Australia. Orce Serrano Hams could be described as the home of Spanish ham and cured meats or indeed an online Spanish experience where you can discover a comprehensive range of Spanish flavours from the simple Spanish olive to the aromatic and complex tones of Iberico ham. Upon entering Gayle and Iains online delicatessen you will be introduced to an array of mouthwatering cured meats and tapas from full Spanish hams to locally hand made chorizos, pork tenderloins, bacalao salt cod, mojama and much more, the Spanish food enthusiast is literally spoilt for choice. Cured meats are sourced from local family run Spanish businesses many of whom have been producing hams and sausages for generations, sausages for example are hand made twice a week and are packed to order for each individual customer to ensure your flavour of Spain is as fresh as it possibly can be. Serrano hams are hand picked directly from the curing houses, tested for maturity and wrapped in muslin before being dispatched the same day  Spanish food simply does not come any more genuine than this! Iain says: The website is designed to be your first port of call not just for quality Spanish food but also product information, regional cuisine, Spanish culture and a fresh approach to online Spanish food shopping. Gayle continues: Working with small family producers here in Spain has always been exciting and has offered the business both fantastic artisan produce as well as some unique product knowledge which we can pass on to our customers. 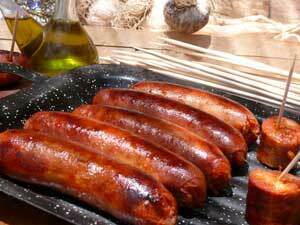 Think Spanish food and you immediately think tapas. Spanish tapas are one of those true gastronomic delights from Spain and Orce Serrano Hams have a full range of exquisite products and useful ideas, customers can try no less than ten different types of Spanish chorizo as well as other harder to find specialities such as Mallorcan sobrasada, morcon or the regional delicassy Lomo de Orza (fried pork tenderloin in herbs preserved in olive oil). Working closely with local butchers the business has also created a recipe for the Fire chorizo as was the customer demand for something a little hotter Gayle and Iain went to work with La Carniceria de Julian in Orce village and created a recipe for a rather hot and spicy fire chorizo  unique tapas indeed. Orce Serrano Hams offer not just a wide range of cured meats and hand painted ceramics but also an enviable standard of customer service and attention to detail with your order. Gayle and Iain are on hand 7 days a week to answer your questions so if you are searching for quality Spanish food online, decorative ceramics or terracotta cookware direct from Spain then www.orceserranohams.com is your one stop shop for all things Spanish.